The Off-Road Grand Prix is a series of four races put on each summer by Deestriders using a 2-lap multi-terrain course which is just short of 5 miles. In theory as the course is the same every month the results should be similar. But there are too many variables; temperature, wind, how long the grass and brambles are, rain, how many midges to name a few things that can skew the results. But for Race 4 they added “how deep is the flood”. A combination of heavy rain and high tides had breached the embankment and flooded much of the river-bank. Early part of the week the course was under a foot of water. As it was only a few inches by Friday the organisers decided a minor variation to avoid the really deep bit was all that was needed, the 4 inches of water across the track wasn’t worth worrying about. But it certainly was different. 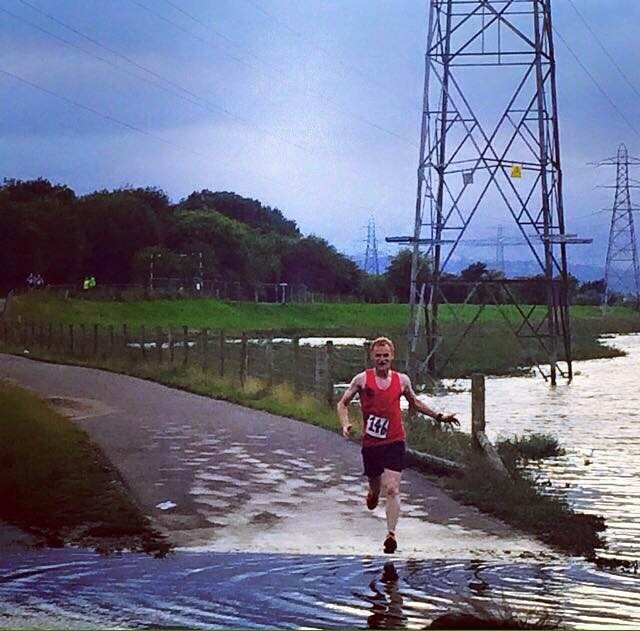 It meant running in very wet shoes! There were 66 runners last night. Concensus was that it was a small field, but the stats show it wasn’t; previous races were; 66, 84 and 67. To qualify for awards athletes need to complete three out of the four races so whilst some people had everything to run for, others were able to give it a miss. They missed out a lot of fun! Buckley numbers were definitely down but in a very busy week for the club (Cilcain, Thurstaton, Brenig, Ben Nevis, Clwydian 15) it is not surprising. It was good to see Gareth back, with Marcus, Paul W, Paul S and myself making up Team Buckley. 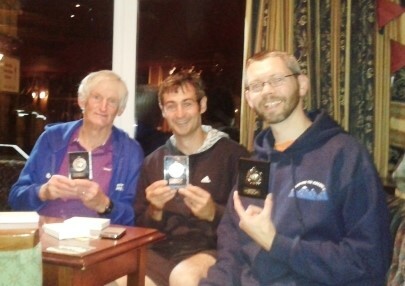 Some great runs, especially Paul Stinton coming 3rd overall and first in his age group. Presentation in the bar afterward is good. While the organisers number-crunch the results we head for the bar and the chips. Some well-earned thanks to the marshals and other helpers and then the prizes revealing a good assortment of Buckley Runners collecting medals.